Cupcakes 'n Daisies: Decisions, Decisions . . . I'm just going to town on my blocks for Belle Meade . . . .
For those of you who've not stopped by lately, or ever, my current project is Belle Meade, by Bonnie Blue Quilts. This quilt has been on my To Do list for ages. I bought the pattern at the Road to California quilt show, last year! Bonnie Blue had this pattern kitted and available at the show using Rouenneries, by French General for Moda. I had been thinking about doing some sort of Ocean Waves pattern and after seeing Bonnie Blue's version, I knew I had found my pattern. When Rural Jardin by French General for Moda was released, I decided to use it for Belle Meade instead. So far this project has been nothing but fun, I spent the end of the year making the required 656 two inch hst units, and in just a matter of a couple of weeks, I've already made 30 of the 41 required blocks. These blocks are very easy to piece, no fudging or fussing, it's been more sewing and going. So now that I've got a design wall full of blocks, I need to decide their placement in the quilt. This is my first instinct . . .
a row of red blocks then a row of blue blocks. If I go this route, I'm done making blue blocks, I just need 11 more red blocks. alternating the red and blue blocks. I like it, it's orderly, which suits my personality, but still has a nice mix going on. So that's where I am right now, do you even see any difference between the 3 pictures, am I just wasting my time and effort with this block placement thing....what do you think? Nicole at Sister's Choice Quilts is sewing right along on Belle Meade too, be sure to check out Nicole's progress!! Well, Thelma, if it were me I would just do the random one because otherwise I would never stop second guessing my decision and I would never actually get anything finished. But of the other two, I think I prefer the first one - the horizontal rows of reds and blues. Whichever way you decide, it's going to be stunning. I love Rural Jardin so much. Yes, I can see the difference, but it is subtle. I think in the end you have to choose which is most pleasing to you. After all you must live with the quilt. It is going to be beautiful! I'm with Jackie. You need to go with what's going to please you because they all look great. I think I like the middle one just a bit better, but I'm not sure why. I do see the difference Thelma, but I don't really think you can go wrong with that fabric and that pattern. I do like the first one better, I think. Random is hard for me as well and I've done it several times, but when I look at those finished quilts now, my eyes go to the blocks that look out of place to me...lol I know, let it go already! Thelma it is absolutely beautiful...I don't think you can go wrong with any setting of it. I would always go with the totally random but that's me...you need to do what works for you. When I had the shop, I always told people they needed to do what they loved, because in the end the quilt was going to live at their house. They are all beautiful. I love the random - I think it makes the eye dance around the quilt looking for a pattern. If that won't work for you, I like the middle setting the best. It will be great no matter what you do! Ok.. Quick response because I'm running out the door but i just HAD to comment. I would avoid #2 because the layout creates subtle lines in the quilt. Something that you might not want on the piece (a little optical illusion with your coziness?). I love the random look but, like you, that is an endeavor that would take hours to do since no two same fabrics can touch, no two same fabric design can touch... you get my drift. Lots of work and not sure if you will ever be completely happy. With that said, I would do # one. The funny thing is that I thought #1 was random until I saw 3. Then I had to go back up and look for the pattern in 1. Even through the colors do form a pattern, for some reason the eye did not create those lines (like in 2). Anyway, I leave you with my 2 cents. Regardless of which way you go, this is turning out beautiful. And remember that the quilting will give the piece a whole different look. Have a great week!! A responsible opposing viewpoint: I like #2. But, as someone else said, the difference among the three is VERY subtle. I like number 2 best followed by number 3. But really, all three work and the difference is minimal. My first choice is the second one, although its not a huge thing, I think that the second option gives the eye somewhere to rest a bit. I'm just curious but what would happen if you started with four the same in the centre (say red) then surround them with blue etc.. again I'm only wondering how it would look. I completely understand, I have problems with randomness myself. I like the middle version, with the red and blue alternating. Either way, I think you are right to get a mix of red and blue and try to keep it mixed rather than letting either color clump up. I have a feeling I will have similar problem with my own Rural Jardin project. I am not nearly as far along as you are...must get to work! I like #2 the best. seems to flow better. Random is hard when you are only working with two colours. Number two is my second choice, but they are all very pretty. wow, I can see the difference, but I actually like all three - including the random one, which I figured I would dislike. That one (#3) may actually have the slight edge as my favorite! #2 is my second and #1 is my third - that one seems a bit more 'in your face' than the other two, which are progressively more blendy. I think it depends on how strongly you want a pattern to emerge, but there isn't a wrong choice in the bunch! I like #2 the best, but all of them are wonderful! I like the second version - being set on point, my eye flows diagonally across the quilt, and that arrangement of color is more pleasing, I think. What a beauty this is turning out to be!! It's going to be stunning no matter what setting you use. I like the second photo the best. I think the first photo has a noticeable horizontal line especially on the top row. But really, they all are fabulous and you can't go wrong with any of these layouts! I like number 2. It still creates organized rows of red and blue squares, diagonally, which has a softer flow and leads my eye further around the quilt. Ha ha! I totally like #3. :) You will enjoy #1 or #2 I'm sure. They are both lovely. I'm liking #2 alot. This will be a spectacular quilt. Arrangement two is my favourite - I like the way it enables my eyes to wander round and think it also enhances the on-point setting. I think it may also be easier to arrange so that the same fabrics aren't next to each other (I wish I didn't notice when this happens on my quilts but I always do...I never do on everyone else's quilts, though!). Whichever arrangement you pick will look great, as always! What does that say about us, that we aren't able to do random? My friend Gail and I just can't do it! We laugh and we try, but we fail and make the blocks orderly. I love your blocks on angle, that's order and random enough. Oh my, I see I need to concentrate on doing more sewing and less goofing around with tablescapes! I vow to catch up with you this week. Me? I vote for random. No question. in the 3 options given... I have to go with #1. The blocks are already scrappy, so giving it a little bit of order gives your eye a place to rest and #1 works best for that. I like the way Strlady said it also. I like option #2 the best. The second one where the blocks are alternated is the most pleasing to the eye, in my opinion. Pretty quilt! #2 would be my choice - it has, as you said, an organized feel without looking quite as rigid as #1 (to my eye). #3 feels a little chaotic to me and that takes the comfort out of it. But, at the end of the day, it's your quilt and aren't we glad that there are no "rules?!" Go with what makes your heart sing. I like the first one, rows of blue and red. I like the random placement, but like you, I find it very difficult to do. The second one would be my next choice. In the first one, I am seeing mostly horizontal lines, not the wonderful scrappyness of the others. I just love how we all see things differently, keeps things interesting! Visually, I see very little difference but if I had to pick, it would be the first one! All are equally wonderful!! I like the totally random arrangement, but like you said, that will probably drive you crazy. I also like the second arrangement, where you alternate red and blue, making a secondary pattern of diagonal blue and red lines. I like the layout in the second picture the best. I can't do random either. I stopped by via Nicole's Sister's Choice Quilt's blog. I like the alternating version! 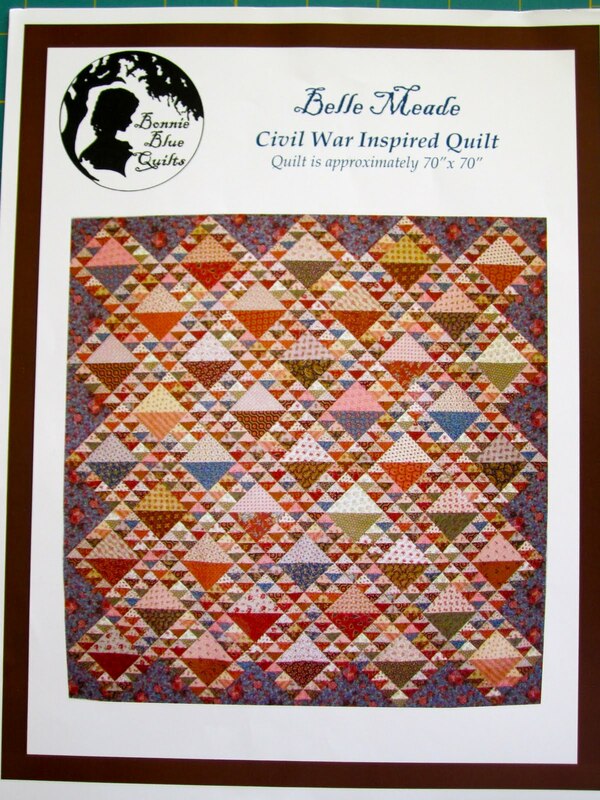 It is so fun to watch the progress on Nicole's and your Belle Meade quilts. Another option would be to put the more subtle blocks (lower on the "value" scale) in the middle, with the stronger blocks around the perimeter; this would give the layout an effect of glowing. Maybe. Or maybe not. I'm sure whatever you decide to do, it will be stunning! Hi Thelma when you get a chance read my blog I have a BLOG AWARD FOR YOU ! Oh my Thelma...that's going to be one amazing quilt. You've already received several opinions....so I'm not going to give you one more to consider! I think they are all great. Oh my! How gorgeous is this? I must add this to my "to-do" list!!!! More Decisions, Decisions . . . . Lifetime Quilt # 9 . . . I'm in Love . . . .
Out with the New, In with the Old . . . .
A Day's Work . . . .
Belle Meade . . . .
Red, White and Wonderful...ly Done ! Finally, Almost Back To Normal . . . .
2011 Goals . . . .
2010 In Review . . .
Building Dreams, Friendships and Memories . . .